PUBLIC RECEPTION: FRIDAY APRIL 14 5:30 - 8:30 p.m. 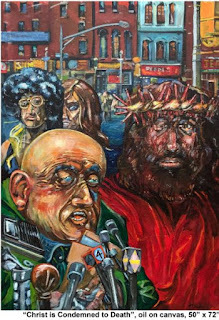 In the late Seventies and early Eighties painter and musician Charles Miller (November 1931-) interpreted the Catholic canonical tradition of the crucifixion of Christ into fourteen, fifty by seventy-two inch oil paintings of the episodic scenes set in urban Boston. He says, "I was trying to get away from the Classic stuff- you know, the Classic church kind of imagery, where everything is nice and and slick and beautiful. That's not what I was trying to do." He succeeded. Tu, W, TH, Sat 1:00 p.m. to 6:00 p.m.